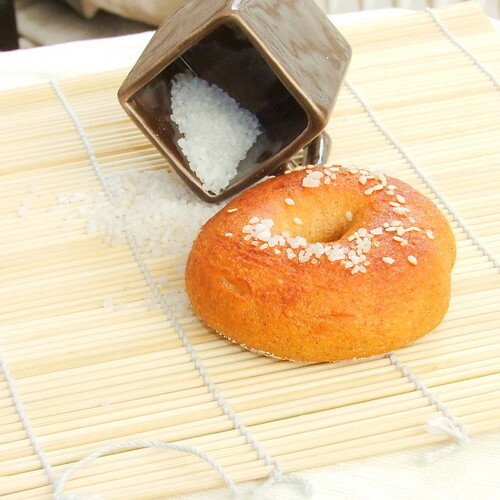 Anda Oana » Baked Goods » Bagel, bagel where were you? I like bread: I like making bread and eating bread. Oh, you knew that already…. I made bagels a few times so far, they were good but not blog worthy. I had Peter Reinhart’s receipe from his wonderful book – The Bread Baker’s Apprentice, but every time I found an excuse to postpone it. It is long, and the fact that you start it today and have the bagels next day was even a better excuse for it. But somehow I started working on one of the best breadish thing I have ever eaten. Stir the yeast into the flour in quite a big bowl. Add the water, whisking or stirring only until it forms a smooth, sticky batter (like pancake batter). Cover the bowl with plastic wrap and leave at room temperature for approximately 2 hours, or until the mixture becomes very foamy and bubbly. It should swell to nearly double in size and collapse when the bowl is tapped on the counter top. Add the additional yeast to the sponge and stir. Then add the rest of the flour, minus 100g, the salt and honey. Stir until the ingredients form a ball, slowly working in the remaining 100g flour to stiffen the dough. Knead the dough on a counter, for a minimum of 10 minutes (it took almost 20 in may case – with small breathing breaks). We are aiming for a firm dough, but elastic and smooth. The final dough should pass te window pane test or register 77 to 81 F on an instant thermometer (sorry for not giving C degrees values, but I used to use the F value when the recipe states it). If the dough seems to dry and rips, add a few drops of water and continue kneading. If the dough seems tacky or sticky, add more flour to achieve the stiffness required. The kneaded dough should feel satiny and pliable but not be tacky. Immediately divide the dough in pieces (I divided mine in 50 g pieces as this is the amount both I and my little C are comfortable with). Form the pieces into rolls. Cover them and let them rest for about 20 minutes. Line a few pans with parchment paper, lightly brushed with oil. Shape the bagels by either poking a hole in the dough roll or by rolling the dough into a rope and pinching the ends together. Place the bagels on the pans, brush with olive oil, cover with plastic wrap and let them sit at room temperature for about 20 minutes until ready to be retarded (hubby laughed like mad when I told him about this step). To see if the bagels are ready to be retarded in the refrigerator use the “float test”: fill a small bowl with cool or room-temperature water. The bagels are ready to be retarded when they float within 10 seconds of being dropped into the water. Take one bagel and test it. If it floats, immediately return the tester bagel to the pan, pat it dry, cover the pan, and place it in the refrigerator overnight (it can stay in the refrigerator for up to 2 days). If the bagel does not float. Return it to the pan and continue to proof the dough at room temperature, checking back every 10 to 20 minutes or so until a tester floats. The following day (or when you are ready to bake the bagels), preheat the oven to 250 degrees C. Bring a large pot of water to a boil (the wider the pot the better), and add the baking soda. Remove the bagels from the refrigerator and gently drop them into the water, boiling only as many as comfortably fit (they should float within 10 seconds). After 30 seconds flip them over and boil for another 30 seconds. If you like very chewy bagels, you can extend the boiling time. While the bagels are boiling, sprinkle the same parchment-lined sheet pans with cornmeal or semolina flour. I topped them with salt (kosher) and sesame seeds. When all the bagels have been boiled, place the pan in the oven and bake for approximately 10 minutes. They freeze well and can be reheated successfully in the microwave. Am I sorry I waited that long to try them? Yes, but I am glad I did it now and I can say they are good, really good. 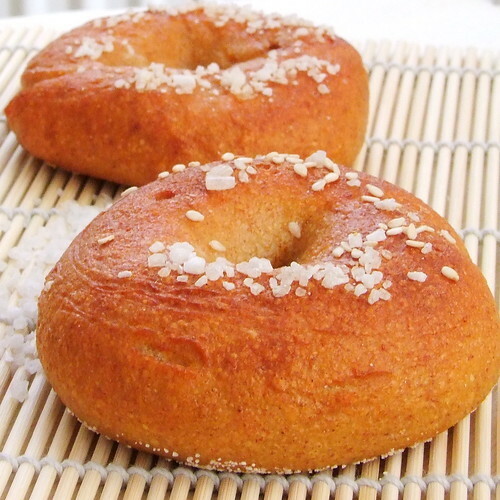 I’ve been dreaming about bagels for a long time… so I can wait to try your recipe… I’m just wondering how it will work with only whole wheat flour ? Most of the times I am doing them with whole wheat but I am adding also some vital wheat gluten (about 2% of the flour quantity).